Grosvenor’s upgrade of two historic properties in Belgravia brings high-end passive housing to Westminster. There was a time when few architects would countenance the idea of retrofitting a historic building to the passive house standard. The typical upgrade to such buildings was — and probably still is — a light-touch approach using natural, breathable materials like lime and calcium silicate. Heavily insulating old walls internally has been avoided, for fear of causing condensation and damaging historic structures. The potential danger is that when you insulate internally you can create a ‘dew point’ between the new insulation and the old wall where the temperature drops and water vapour condenses to liquid, potentially leading to mould. But recently, pioneering projects have turned this old logic on its head, using new technology — such as condensation and thermal bridge analysis software, and in-wall moisture monitors — to upgrade historic buildings to modern standards of super-insulation. 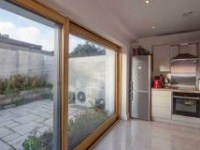 Passive house design firm Green Tomato Energy & contractor Princedale Homes broke new ground with the experimental upgrade of historic properties at Princedale Road and Lena Gardens in London to the passive house standard. These houses were only passive certified on the basis that moisture monitors were installed within the building fabric to watch for possible condensation risks. Now Sturgis Carbon Profiling (SCP), a Londonbased sustainability consultancy and architectural practice, has completed the upgrade of two 19th century properties at 11 and 19 Passmore Street in Belgravia, Westminister to the Enerphit standard, the Passive House Institute’s benchmark for renovation. These upgrades are at the forefront of efforts by Grosvenor Great Britain & Ireland, which owns thousands of properties in London, to reduce the carbon footprint of its building stock. Grosvenor is now aiming to reduce the carbon footprint of its property portfolio by 38%, and to get all its properties up to an energy cert of D or higher. The Passmore Street upgrades are the first of six Enerphits in Grosvenor’s pipeline: a third in Mayfair was awaiting certification at the time of writing, two further projects are on site, and one large mixed use building is at design stage. Grosvenor’s retrofit manager, Mike Levey, says passive house offers more practical benefits for Grosvenor than standards like Breeam or Leed. This is because it is entirely focused on building fabric, energy efficiency, comfort and indoor air quality — rather than extraneous factors like transport. SCP advises Grosvenor on how to reduce the carbon footprint of its buildings. As part of this effort, thirteen properties on Passmore Street received external insulation to their rear facades, plus solar photovoltaic panels. But Grosvenor aimed for Enerphit at the two vacant properties on the street. Passive-spec timber frame extensions were also built at the back of these two dwellings. The extensions gave the design team more room to play around with inside, so they moved the bathrooms upstairs, and made the groundfloor living areas more open plan. 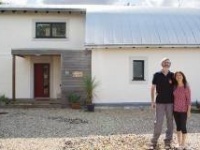 “Because the houses were small, the extensions actually added quite a lot of floor area,” says Maiia Guermanova, architect and certified passive house designer with SCP. To maintain the historic facades, internal insulation was the only option for the front walls. This meant losing some floor area, and carried the potential risk of condensation, so SCP specified Aerogel insulation — a synthetic, ultralight, breathable and highly insulating material — which delivers a U-value of 0.19 for just 70mm thickness. 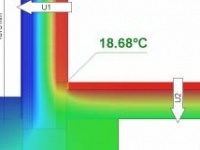 Choosing a breathable material helped mitigate the risk of condensation, says Guermanova, while analysis using the Wufi software also indicated that the build-up is safe. The front facades are rendered too, which will help prevent rain and moisture getting into the building fabric. Designing out thermal bridges — points where cold structures penetrate the insulation layer — also eliminated possible dew points. SCP prepared twenty-six individual thermal bridging details for the retrofit, and carried out 3D thermal modelling of the building’s steel supports. The whole Passmore Street terrace was externally insulated at the rear with 90mm of Baumit EPS, but the two Enerphits received a further 53mm of PIR insulation internally here too. The roof was insulated with mineral wool and PIR board, which was used internally where moisture risks were low to reduce costs. The party walls were also insulated. To preserve its historic appearance, SCP specified Green Tomato Energy’s mock-sash triple-glazed timber windows to the front facade. While traditional sliding sash windows are impossible to make airtight, these units look like classic sashes but instead open inwards. The rear facades of the Enerphit houses feature passive house certified triple-glazed casement windows. Naturally with any Enerphit project, airtightness was one of the biggest challenges. 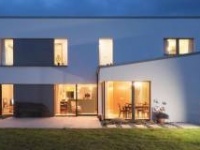 This was project manager Grangewood’s first passive house project, so SCP provided extensive training in airtightness and other passive house concepts to the builders, and to subcontractors such as electricians and plumbers. The whole team also visited the Target Zero passive house training centre in Ireland before work began on site. A continuous airtightness membrane forms the air barrier for the walls, roof and floor. Grangewood site manager Paul Hart admits the jobs were demanding, and says the biggest challenge was locating air leaks in old buildings — and finding the right team to carry out such onerous and detailed airtightness work. But the lessons learned at the first Passmore Street project were carried over to the second. The first airtightness test at No 11 came in at about six air changes per hour (ACH); it took a further two weeks of sealing to get it down to 0.8. But the first test at No 19 came in at 1.2 ACH, and it took just one day’s work to get down to 0.9 (the Enerphit target is 1.0). Passmore Street projects. “We also found that continuous air testing can put the project behind by causing membranes to pull apart at taped joint,” he says. Grosvenor had bought their own blower door machine to keep testing during the build, but Hart reckons too much testing can be counter-productive. Now that Grosvenor, CGS and Grangewood have completed these two dwellings, what other lessons can they take forward into their next batch of Enerphit projects? Guermanova offers some common sense tips: order components early to allow a longer lead-in time for specialist systems — and to have more time for the detailed work required on site. Allow more time in the build schedule too. Do your first airtightness test as early as possible, but after membranes are fixed with timber battens, otherwise it may balloon and rip off. Grosvenor’s retrofit manager Mike Levey says reaching Enerphit might not have been possible if they had used a normal competitive tender to find a builder, because it would have given a team that was “trying to cut corners right unto the death”. Instead Grosvenor chose Grangewood, their preferred builder for domestic retrofits. The Passmore Street properties are now the first privately-rented Enerphit projects in London, but Levey doesn’t believe the rental market knows enough about passive house for Grosvenor to charge a premium. He thinks this will change quickly, however, as consumers become aware of the benefits of passive house — in terms of comfort, health and energy bills. For Grosvenor, the Passmore Street Enerphits were research projects with larger-than-normal budgets. Levey estimates they ended up costing between 17% and 19% more than one of Grosvenor’s typical whole-building upgrades. He thinks they can eventually get this figure down to 5%, but reckons that for retrofitting historic buildings to passive house standards, there will always be a small premium to pay. These upgrades weren’t just about energy and comfort though, but Grosvenor’s wider aim of reducing its carbon footprint. SCP carried out a carbon life cycle analysis of the refurbished homes, and found that operational energy will be responsible for just 12% of the building’s carbon emissions over a 60 year life cycle, 50-75% less than a benchmark typical retrofit. Meanwhile, the embodied carbon of retrofit was responsible for 88% of the building’s life cycle emissions, of which 19% were for Enerphit ‘extras’ that wouldn’t have been included in a normal retrofit. Most of this came from the use of synthetic insulation materials like PIR and phenolic boards. But still, SCP found the two buildings combined all save about 840,000 kg of CO2 equivalent over their lifetime. And making an effort to reuse elements of the building fabric, as well as items like sanitaryware and appliances, could cut this by up to 20% more. Beyond the five Enerphit projects on its books now, Grosvenor will continue to upgrade some of its buildings to the Enerphit standard when they become vacant. With so many historic properties in London, the standard offers a way of future-proofing their building portfolio. Building type: two 1960s solid-brick mid terrace houses, internal floor area of 72.6 square metres. New extensions of 10 sq m.
Environmental assessment method: zero carbon according to Sap. Breeam ‘Outstanding’ certification pending. After: Existing 220mm brick wall followed inside by 20mm parge coat, 50mm Aerogel insulation, Siga Majpell vapour control layer & airtightness membrane, 30mm Spacetherm board incorporating 20mm Aerogel and 10mm magnesium silicate board. U-value: 0.19 W/m2K. Party walls: Existing brick walls followed inside by 20mm parge coat, Siga Majpell vapour control and airtightness membrane, 52.5mm Kingspan Kooltherm phenolic insulation. Before: Traditional single-glazed sash windows to front and single-glazed Crittall steel-framed windows to rear. New windows: Green Tomato Energy sash look-alike casement windows. Timber frame window/tripleglazing with two low-e coatings and argon filled with TGI spacer. Overall U-value: 1.06. Passive House Institute Certified Zyle Fenster triple-glazed alu-clad timber windows with overall U-value of 0.78 W/2K. Heating system: Vaillant Ecotec Plus 824 condensing gas combi boiler. Before: no ventilation system. Reliant on infiltration and opening of windows for air changes. After: Paul Focus 200 mechanical heat recovery ventilation system, Passive House Institute certified heat recovery efficiency of 91%.